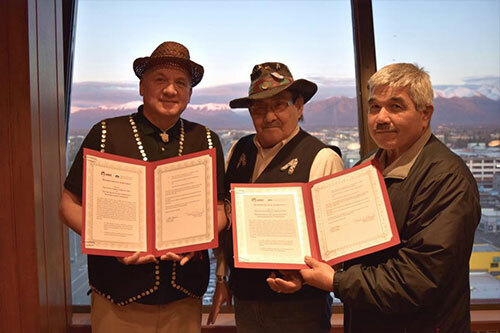 (SitNews) Anchorage, Alaska - The United Tribes of Bristol Bay (UTBB) and Southeast Alaska Indigenous Transboundary Commission (SEITC) announced their intent this week to formalize their efforts to protect their indigenous ways of life and the watersheds that sustain them. Both tribal consortiums have been working to stop proposed mega mines in their respective regions: Pebble in Bristol Bay and multiple Transboundary mining threats in Southeast Alaska. Kicking-off the Alaska Federation of Natives Conference week in Anchorage, the entities held a joint-reception on October 17. Together, the two groups include almost 30 federally recognized-Tribes spanning the Yup’ik, Dena’ina, Alutiiq, Tlingit, Ts’imshian, and Haida peoples who continue living their way of life in tune with natural cycles and keeping alive customary and traditional practices. SEITC Chariman Frederick Olsen Jr., SEITC Secretary John Morris and United Tribes of Bristol Bay President Robert Heyano hold the Memorandum of Agreement uniting the two groups in their efforts to stop proposed mega mines in their respective regions. United Tribes of Bristal Bay’s member tribes represent 80 percent of the population of the region in fourteen Yup’ik, Denai’na, and Alutiq indigenous communities in Bristol Bay. UTBB’s mission is to protect the lands and waters that support the traditional way of life of the indigenous people of Bristol Bay by advocating against unsustainable large-scale hard rock mines like the Pebble project. The 14 United Tribes of Bristal Bay member tribes are: Togiak Traditional Council, Twin Hills Village Council, Manakotak Village Council, Curyung Tribal Council, Ekuk Village Council, Clark’s Point Village Council, Aleknagik Traditional Council, Portage Creek Village Council, New Stuyahok Traditional Council, New Koliganek Village Council, Levelock Village Council, Nondalton Village Council, Pilot Point Tribal Council, and Chignik Lake Tribal Council. The SEITC (formerly known as United Tribal Transboundary Mining Work Group) is comprised of fifteen Tribes of Southeast Alaska with a mission to protect Tribal lands and waterways for future generations, Olsen said. The 15 Southeast Alaska Indigenous Transboundary Commission’s Member Tribes are: Central Council of Tlingit and Haida Indian Tribes of Alaska, Chilkat Indian Village, Craig Tribal Association, Douglas Indian Association, Hydaburg Cooperative Association, Ketchikan Indian Community, Klawock Cooperative Association, Metlakatla Indian Community, Organized Village of Kake, Organized Village of Kasaan, Organized Village of Saxman, Sitka Tribe of Alaska, Petersburg Indian Association, Wrangell Cooperative Association, Yakutat Tlingit Tribe.